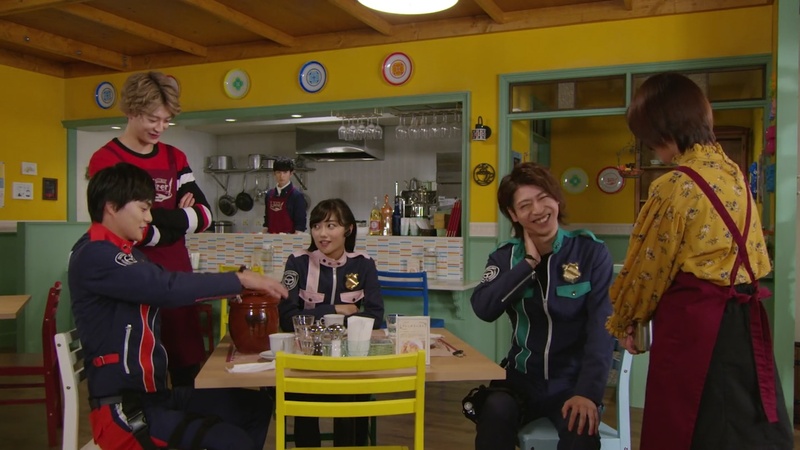 Tsukasa is happy to see Keiichiro & Kairi and Sakuya & Umika getting along. Down in the underworld, Dogranio calls for Destra and notes he hasn’t shown himself to him in a while. Dogranio says it’s alright, but he misses seeing Destra rampage. He says that if he hadn’t given Destra a position by his side, Destra probably would’ve already eliminated all the competition for the throne by now. Later, Tsukasa approaches Tooma and cautions him about doing anything that might affect Kairi and Umika. Tooma says Kairi told him about the Pats investigating them. Tsukasa wonders if Tooma hates her, but he just warns her not to concern herself with Kairi and Umika. Tooma says she is welcome as a customer, but she should draw the line there. Tsukasa asks what he means by that, but he says there’s no hidden meaning. Tsukasa says there’s nothing wrong with them being close. 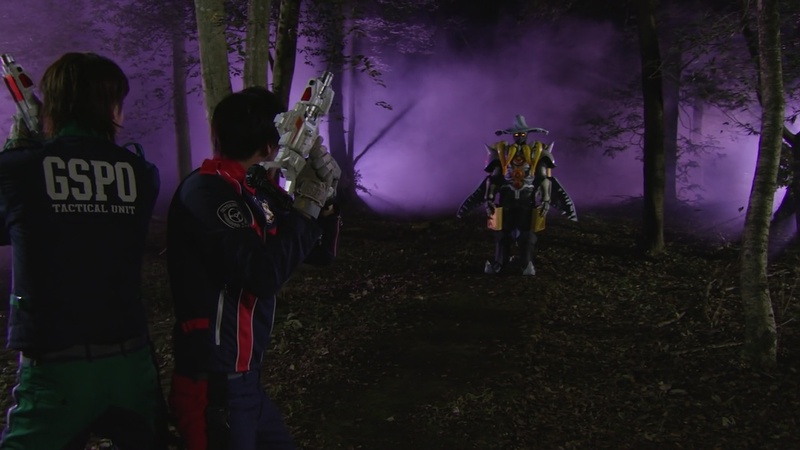 Just then, Destra appears and targets Tsukasa. She pushes Tooma out of the way and morphs. Noel is at HQ when Jim Carter gets the alert. 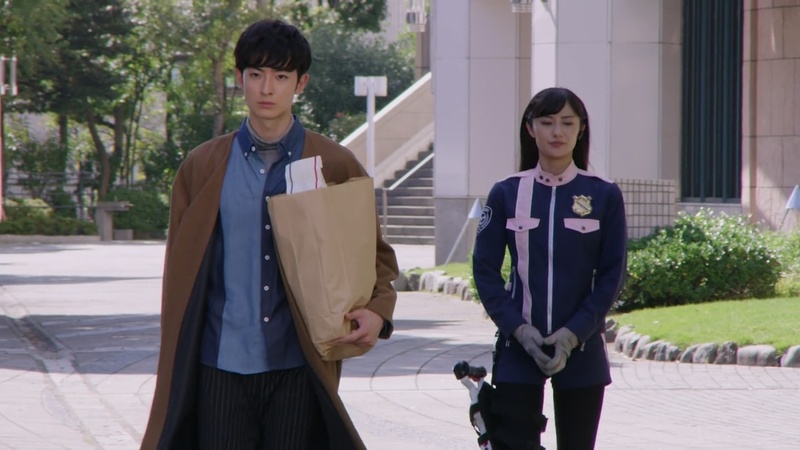 He heads out as Jim Carter calls Keiichiro and Sakuya. Tooma sends Kairi and Umika the coordinates. Tsukasa does her best against Destra as Noel arrives to help. 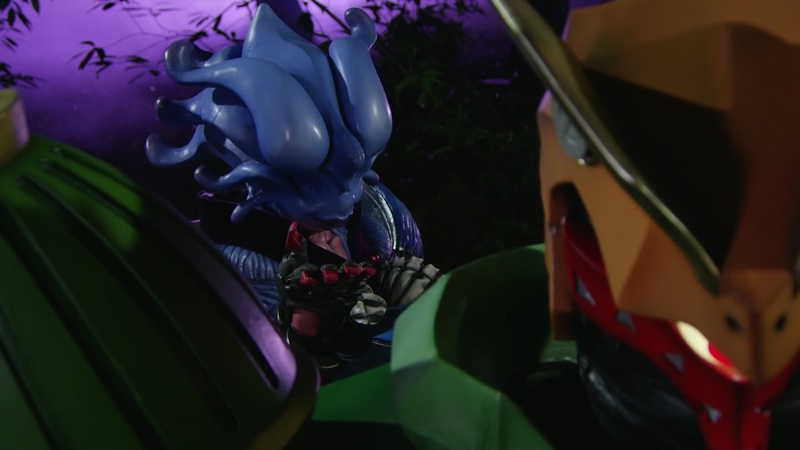 But Destra knocks Tsukasa into crates where Tooma is watching from, causing her to demorph. Destra opens a portal and sends Tsukasa and Tooma into it. Noel knows Destra is trapping them in “the other world.” Destra says he wants to kill them all in front of Dogranio. Destra whacks Noel into the water and leaves to find the others. Down in the underworld, Tsukasa wakes up and hurries over to Tooma who just wakes up as well. They realize they are in the Gangler world when they see Podamans patrolling the forest. Tsukasa tells Tooma to stay close. They take shelter in a cave where Tsukasa bandages herself up. She apologizes for getting him involved in this, but Tooma says it’s his own fault. 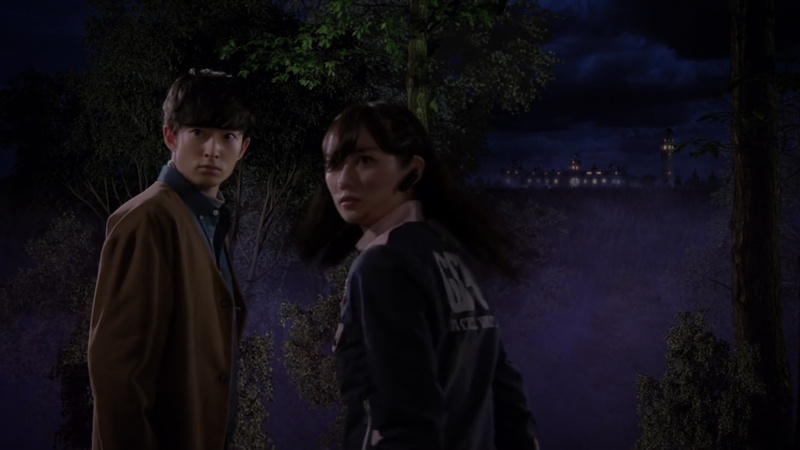 Tsukasa tells him to leave her behind and run if it comes to that. She notices that Tooma is very calm about the whole thing and says she should recruit him for the tactical unit. Just then, Podamans arrive and Tsukasa shoots. She tells Tooma to run as she fights the Podamans on her own. He hesitates. Suddenly a Podaman runs toward him. 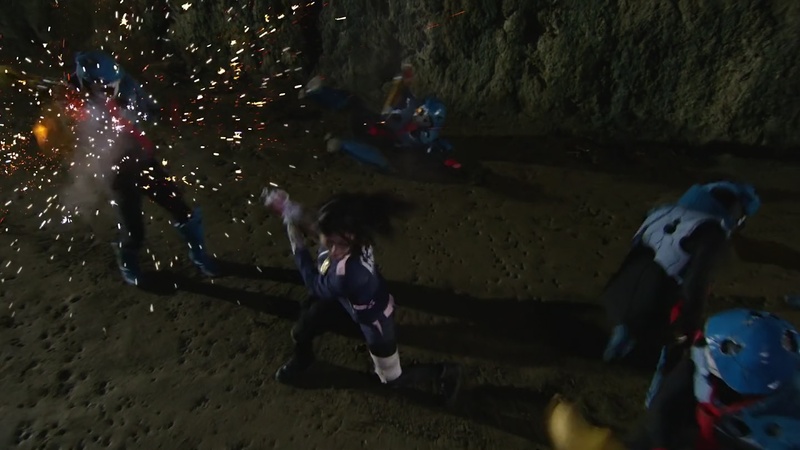 Tsukasa sees and she quickly grabs a rock and throws it at the Podaman, knocking it out. Tsukasa continues taking on the Podamans, but her injured leg acts up and in that split second, allows a Podaman to have a clean shot at her. 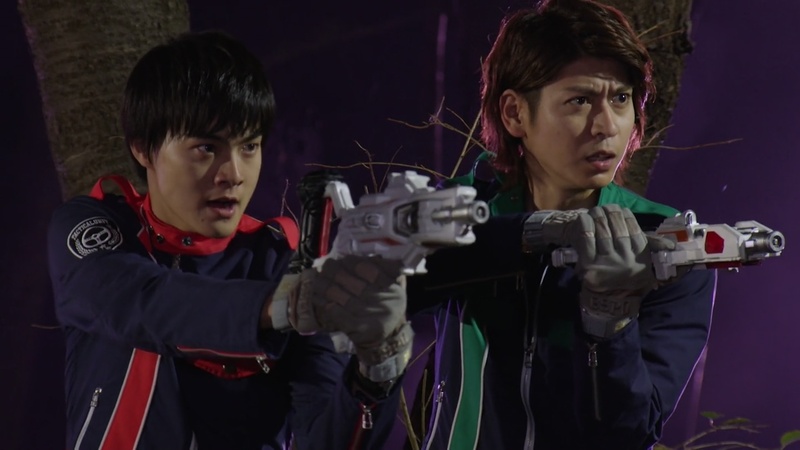 But Tooma jumps in and knocks the Podaman out of the way, saving Tsukasa. He says the others would never forgive him if he let something happen to her, especially Kairi and Umika. Tsukasa knows Tooma really cares for Kairi and Umika. Destra finds Keiichiro and Sakuya and sends them through the portal. They prepare to jump back through, but Zamigo suddenly appears. Before Destra can close the portal, Kairi, Umika and Noel wrap his arms to stop him and keep the portal open. Destra yanks the three of them down from the rooftops and closes the portal. Kairi, Umika and Noel morph. The Podamans catch up to Tsukasa and Tooma. 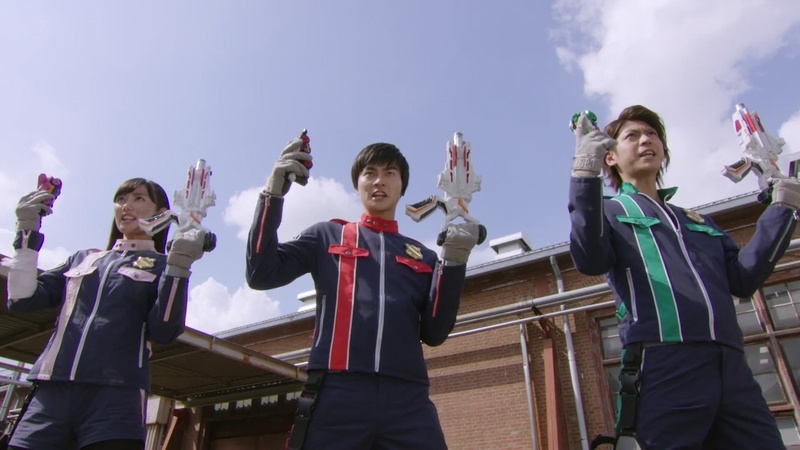 They knock Tsukasa’s blaster out of her hands. Tooma picks it up and shoots perfectly at three Podamans. 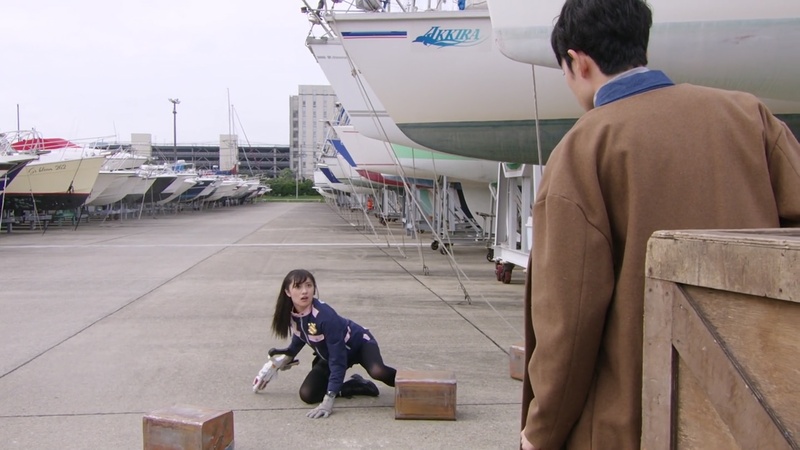 Tsukasa kicks the Podaman on top of her off as Keiichiro and Sakuya arrive. Meanwhile, Destra is in complete control against the others. Not even Kairi going Super helps against Destra. Destra knocks Kairi down and is about to finish him off. But Kairi’s Super power allows him to see the others jumping out of the portal in a few seconds, giving him the confidence against Destra. Tsukasa tells Tooma to run to safety as the Pats morph. The Pats take on Destra and that allows Tooma and Umika to open his safes. But the safes are empty and they all realize Destra don’t need no Pieces to be this strong. Noel goes Super and The Pats go U-gou and they deliver finishers at Destra. He seems to explode. But he’s actually perfectly fine. He summons white Gorams and leaves. The Pats separate and Tsukasa demorphs, reaching her limit. The Lups hop into Victory LupinKaiser and Noel hops into X Emperor Slash. With a couple of power ups, they finish off the two Gorams. Later, Keiichiro and Sakuya explain how Zamigo appeared and opened a portal for them. They question why a Gangler would help them. Zamigo says he just doesn’t want his toys to be taken away from him. Commander Hilltop commends Tsukasa for holding up well alone in the underworld. Tsukasa says Tooma helped her, even though he’s a civilian. Sakuya says maybe he like action movies. Tsukasa starts to wonder if maybe there’s more to Tooma than just being a chef. Down in the underworld, Destra cannot believe he was almost defeated by humans. Goche offers to lend him a Collection Piece. Finally! A truly great episode! It was definitely a Tsukasa-focus ep with some Tooma-focus mixed in. But also another good episode of a Lup and a Pat interacting with each other. Something that I am realizing did not happen as much as it should have over the course of the season. Anyway, Tsukasa taking the lead and being the badass that she was is definitely awesome to watch. It was great seeing her pretty much almost invincible against the Podamans. I do wish they didn’t need to kind of pull her back a little just to keep her human and allow Tooma to swoop in to save her. But still, overall, it was great seeing her taking the Podamans and even Destra a little bit on her own. It was a good episode for her in the action aspect. But I very much welcome seeing her intuitive side coming out for even just a few seconds. I really hope she is the first one that figures out the Lups’ identities. Not just handed to her or the Pats, but them actually figuring it out before ultimately confronting them or having some big reveal moment where the Lups out themselves. As for Tooma, it was a good episode for him. And like the other good-to-great Tooma-focus episodes, it helped peel of some of the layers from his personality. We again see he isn’t just this cold, emotionless guy. He cares about his friends and he appeared to also care about Tsukasa as well. Zamigo, meanwhile, is a tease once again. We already know he and Destra aren’t really BFFs. And it is perfectly reasonable for him to want to save the Pats from the underworld just so he can play with them later on. But I also hope that moment between him and Keiichiro and Sakuya is also part of a bigger picture reveal relating to him. Overall, a great, enjoyable and exciting episode! Finally! This is Episode 41, after all. We shouldn’t have any more slow, unexciting filler episodes from here on out. Oh yes. I think Zamigo only cares about himself. Not the LuPats and not Dogranio either. Lupin Expose would make both side be in a Dilemma. Since they are close/friendly now. It would definitely makes things very exciting.